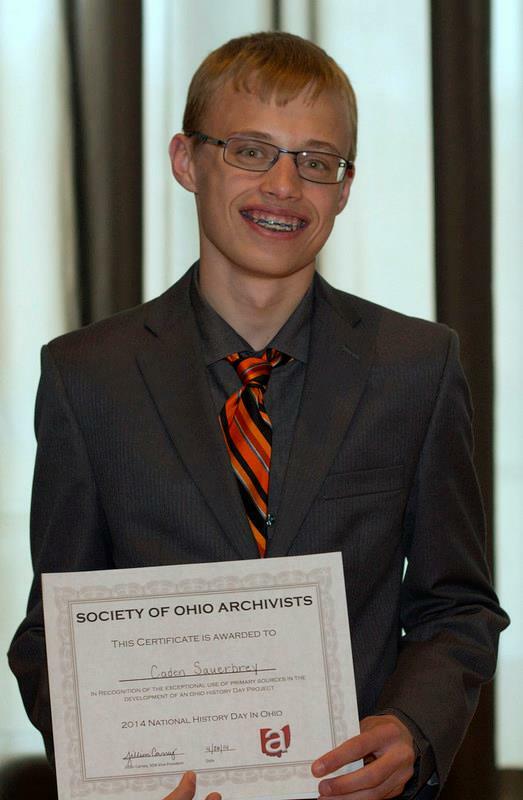 The Society of Ohio Archivists wishes to recognize an Ohio History Day Project in the Junior and Senior Division for exceptional use of primary sources or manuscripts in the development of their Ohio History Day Project. This award was initiated in 1999. Award recipients are given a certificate and a $100.00 cash award for a winner–individual or group–in both the Junior and Senior Divisions. Project must demonstrate exceptional research and use of primary sources to include at least two of the following: letters, speeches, diaries, newspaper articles from the time, oral history interviews, documents, photographs, artifacts, or anything else that provides a first hand account about a person or event. 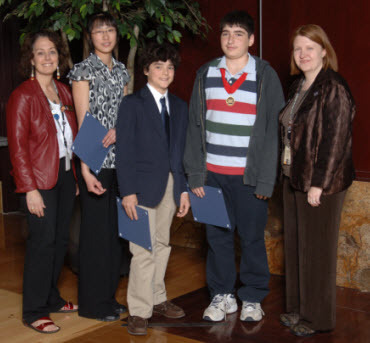 History Day Project winners must have used primary resources on site at a research institution housing those materials. All primary sources must be cited accurately in the bibliography of the paper. All of these award winners are to be commended for their extensive use of primary sources! For her individual performance, Leigh Morris portrayed an ancestor five generations back who was respected on both sides as European Americans in the 1830s removed Native Americans from the Maumee Valley. She used resources in the Toledo Public Library’s Local History section, the Fulton County Historical Society, and Northwest State Community College—resources such as addresses, memorials, a personal journal and a memoir, and newspaper clippings and county histories—as well as interviewing a community historian researching the ancestor’s writings as she prepared for this performance. For their group documentary on the May 4, 1970 shootings at Kent State University, Theodora Brown and Ava Yacovone used primary sources—photographs, news clippings, and media footage especially—from the Cleveland Public Library, the Kent State University Archives, oral interviews and online sites to develop their production on the tragic event during the Vietnam War. 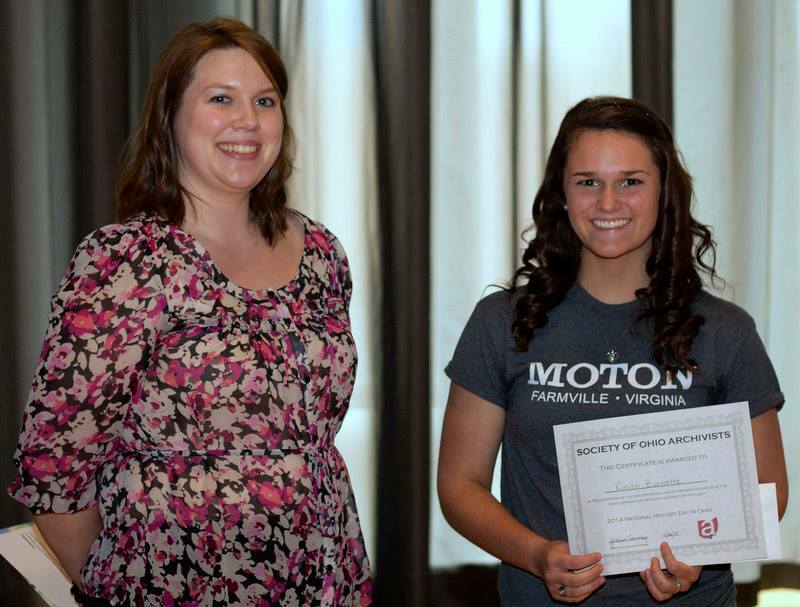 Senior Division: Kirstin Burnette, South Gallia High School, for her senior individual exhibit, “‘It Seemed Like Reaching for the Moon’ Dorothy Davis v. Prince Edward County–Their Right to an Equal Integrated Education”. 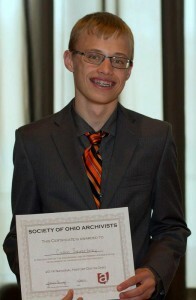 Junior Division: Caden Sauerbrey, Tri-Valley Middle School, for his junior individual documentary, “Remember the Promises You Made in the Attic: The 1912 Dayton, Ohio Flood and the Formation of the Miami Conservancy District”. Junior Division: Taylor Burnette and Chad Bostic, South Gallia Junior High School, for the group exhibit “It All Started on a Bus: One Woman Sat Down and the World Turned Around.” Burnette and Bostic visited numerous museums and archives and used primary resources such as newspapers, photographs, and interviews to highlight the role Rosa Parks played in the Civil Rights Movement in refusing to give up her seat on a bus. Senior Division: Makayla Varisco, Emily Doane, Rebecca Willis, Christian Community School, for the group exhibit “Oberlin College: Opening the Doors to Equality.” This group extensively used primary resources from the Oberlin College Archives, including photographs, governing documents, and newspapers to demonstrate the significance and impact made by Oberlin College when it became the first institution of higher learning in the nation to offer a coeducational curriculum. Senior Division: Shelby Wenzlaff, Olentangy Orange High School. The Legacy of Alice Paul. On Saturday, April 24, 2010, over 600 students competed in the National History Day in Ohio competition at the Ohio Union building on the campus of The Ohio State University. This year we selected two winners for the Junior Division. 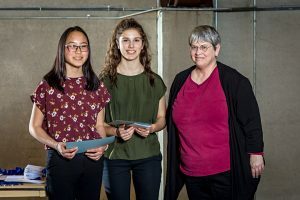 Senior Division: Claire Lo of Shaker Heights High School for “The Devil’s Rope: Pioneering the West.” Claire’s exhibit illustrated barbed wire and its role in the settlement of the west. For her research, Claire used the National Archives’ patent collection and original artifacts from the Devil’s Rope Museum in McLean, Texas. She also used the Cleveland Public Libraryâs microfilm collection. Junior Division: Stephen Cosco for The Making of the Movies: Opening Horizons and Transforming Entertainment. Stephen’s documentary focused on the creation of the movies and the work of two Ohio inventors: Thomas Edison and C.F. Jenkins. For his research, he visited Greenfield Village, the Wayne County Historical Society in Richmond, Indiana, the Public Library of Cincinnati and Hamilton County, and the Cincinnati Historical Society. Amir Farhat of Birchwood School for “Garrett Augustus Morgan: An Inventor Whose Inventions Still Save Many Lives Today.” Amir’s research paper discussed the inventions of African American inventor Garrett Augustus Morgan. For his research, Amir visited the Western Reserve Historical Society, where he viewed letters, patent documents, advertisements and newspaper articles. Senior Division: Jacob Miller, Jack O’Halloran, Nathaniel Henry, Leo Katz, Isaac Hoffman, Shaker Heights High School. “Tom Johnson: Progressive Reform for the Common Man”. Junior Division: Julia McDaniel and Rachel Farrow, Genoa Middle School, Westerville. “The American Legacy: Freedom, Opportunity and Self-Betrayal.” Julia and Rachel used the Toyo Suyemoto collection from the OSU Rare Books and Manuscripts Library for their project on Japanese internment camps. They read the diaries and letters in the collection and then contacted Ms. Suyemoto, a retired OSU librarian, and interviewed her for their project. Senior Division: Anirudh Dasarathy, Birchwood School, Cleveland. “Korematsu v. United States: A Conflict Between National Security and the Rights of the Japanese Americans.” Anirudh used photographs from the Cleveland Public Library and the government documents from the National Archives and Records Administration for his documentary on the Korematsu case. Lee’s well-researched project utilized original recordings, newspaper clippings, and interviews with Louis Armstrong to form an analysis of the musician’s role in the Civil Rights movement in the U.S.
Stofan’s project used newspaper articles, documents, and photographs to construct her portrayal of one of the newsboys who went to the streets in 1899 demanding fair pay for selling newspapers on the streets of New York. 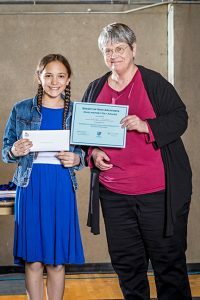 Stofan went on to the National History Day competition, where she ranked 7th in the Junior Individual Performance category and was awarded Outstanding State Entry. For their performance on Karamu House, Phillips and Stofan utilized contemporary books, lectures, letters, magazine and newspaper articles, pamphlets, photographs, recordings, and a thesis stretching from the 1930s to the 1980s, along with recent interviews and recordings to explore the history of an experimental theater situated in a settlement house that has provided an exchanged across cultural and racial lines and has had not only a local but also a national impact. The pair also became national finalists in this category at the state competition. For her exhibit on the Aleutian Island during World War II, Wittekind drew upon a number of contemporary primary source accounts–newspaper articles, magazine articles, government newsreels and books-along with more recently completed oral history memoirs and films to develop her project on the encounters between American and Japanese forces and the Aleut people, and the difficult environmental challenges of this “forgotten” wartime front. For her historical paper on Ohio native Victoria Woodhull who in 1872 became the first woman to run for President of the United States, Wittekind used numerous contemporary newspaper articles and letters, books, cartoons, congressional documents, even census records and deed records, along with interviews of present-day scholars and interpreters to document her work on this controversial figure in the movement for women’s rights. Wittekind, who also received the SOA award in 2002, was a national finalist in her category in the state competition. For their group performance on lands issues in the Ohio country from the 1760s to the 1790s Little, Miller and Rose used correspondence and letters, journals, speeches, treaties, state papers, and early Ohio newspapers to document and interpret the political, cultural and military clashes that involved the English, the breakaway United States, and indigenous nations over rights and responsibilities related to the land that the United States federal government eventually came to govern, settle and develop. The group was a national finalist in its category in the state competition. For her historical paper on the New Deal “greenbelt community” near Cincinnati, Wittekind drew upon Congressional documents, presidential papers, contemporary newspaper and national magazine articles, as well as contemporary photographs of Greenhills now available on American Memory web site to study and evaluate the significance of this experimental community. Wittekind also placed first in her category. For her individual performance on Cleveland during World War II, Gillespie drew upon contemporary books, numerous newspaper clippings, personal interviews with four people who were living in Cleveland during the period, even period music and an interview with an archivist to develop her portrayal of the cityâs course during the time under consideration. 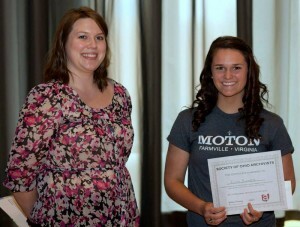 Gillespie also placed second in her category. For his exhibit on Justice Sandra Day O’Connor Carter read a large number of her US Supreme Court opinions, used magazine articles from the early 1980s from the time when Justice O’Connor was appointed to the court and, above all, arranged for a 45-minute interview with Justice O’Connor in her office earlier in the year to gain perspectives on Justice O’Connor’s distinction as the pioneer woman justice on the court. For their group performance on the Vietnam War Baig, Chai and Miller used a large number of magazine and newspaper articles from the war years, conducted personal interviews with 10 veterans, and collected survey research forms from eight other veterans of the war to gain an understanding of the personal frontiers servicemen and servicewomen encountered in that conflict. Elyse Meena’s project “The Fix that Turned Baseball,” focused on the 1919 Black Sox World Series scandal. For this project, Elyse Meena used the archives at the National Baseball Hall of Fame in Cooperstown, NY, the baseball collection at the Cleveland Public Library, and the photographic resources at the Western Reserve Historical Society to examine and cite books, news articles and letters from the early 20th century for information essential to her performance. Individual Exhibit: “Sputnik: A Turning Point in History”. Lucille Frey’s project “Sputnik: A Turning Point in History” focused on Sputnik, the first man-made satellite to orbit the earth, and was launched in October, 1957. For her project she incorporated information from local and national newspapers, news magazines and scientific magazine sources from the 1950s along with United States and (translated) Russian government memoranda and documents from the same period, and conducted an interview with a person who worked with Wehner Von Braun in her exhibit. Lindsay Kocab, in her research on women working in World War II, used a variety of primary sources to learn about her topic. She began her research at the Cleveland Public Library and in the Cleveland Press Archives at Cleveland State University, drawing on these institutions’ extensive photograph collections of World War II. She also gained information on advertisements and stories of women in WWII from magazines of the time period, such as National Geographic, Life, and the Saturday Evening Post. She contacted the Smithsonian for WWII posters. In addition to this extensive research, she conducted oral history interviews with members of her own family. Her grandmother and great aunt worked as tracers at the Electric Controller Company in Cleveland during the war. These interviews gave her direct insight into the experiences of women working in WWII. Using all of these primary sources, along with additional secondary sources, Lindsay was able to present a clear picture of women working in WWII from a variety of perspectives. Individual Exhibit: “Science & Technology, A Deadly Combination: Donora Smog, 1948”. Betsy Carney, in her individual exhibit on the Donora Smog, utilized primary sources to learn about the events surrounding a deadly smog created by the local steel mills and zinc works in combination with foggy weather conditions in Donora, Pennsylvania, in 1948. Her exhibit outlined the events causing the disaster and how it affected Donora and the people living there. She also demonstrated how the Donora Disaster directly influenced the passage of Clean Air Legislation. She researched newspapers of the time and also located photographs in the local library and historical society. Probably the most valuable information was gained through oral history interviews with persons who lived through the disaster. Betsy was able to learn what impact the deadly smog had on local residents’ health and lives, how it affected the town’s economy, and the greater impact it had on legislation for clean air nationwide.